This is one of the fires without big consequences but it is a very curious and uncommon cause. 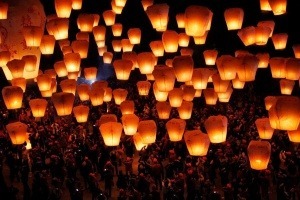 We know that it is usual in some countries to launch to the sky balloons with fire inside. Well, one of these balloons caused a fire in Colombia time ago according to Teletica.com. In one of our articles we saw the most common causes of fires at home, we wrote as well about arson fires, fire caused by fireworks, others caused by spontaneous human combustion but never something like this. Firefighters were alerted after midnight. They extinguished the fire quickly. Apparently a spark fell from the balloon to the roof of one of the houses, located in a poor area. In total there were two families affected who are completely homeless now because of the fire. The Fire Department of the city has warned of the danger of these balloons as they are becoming very popular and apparently, according Teletica.com, it is not the first fire occurring in the area.